Corvair Mission 2019, Part #5, Finishing Schools and assembly/run instruction. Keeping in mind the central focus of the mission is to share what we know with builders by effective, rewarding paths, this story focuses on something that has proven to work very well for a number of people: Close person instruction at our shops here in North East Florida. In the last 3 years, we have held a number of “Finishing Schools” at the SPA factory here in Florida. The best look at the process chan be seen here: Corvair Finishing School #1, Video report. These are small events, highly focused on getting every engine on hand running, with the builders learning a lot. With just 3-4 engines going together, and both Dan Weseman and myself present, it is a more intense learning session than a typical large college. But they are also fun events, where we hit the local bar and grill for dinner and share the social side of building also. .
We currently are studying dates for the next finishing school, which will be held in the next 90 days. 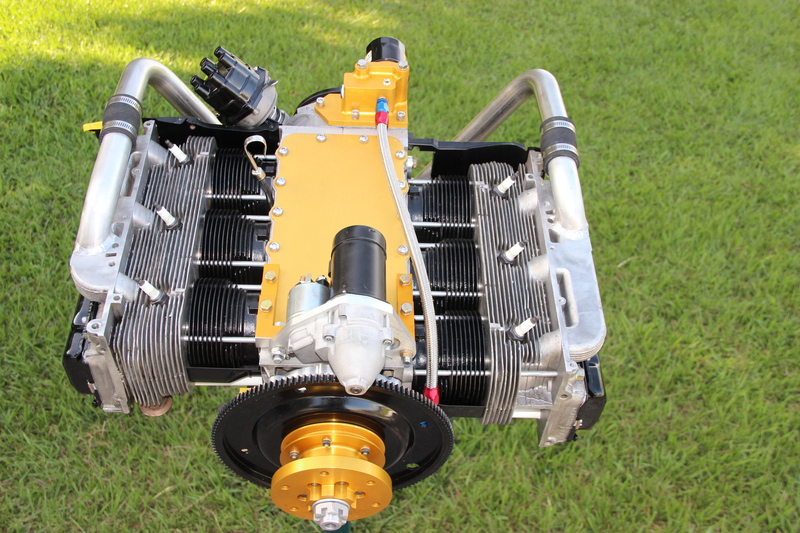 We already have several Engine in a Box builders on board, and we are just looking for one more person who is willing to complete their engine or even purchase a EIB kit motor to fill out the schedule. If you think this sounds like you, Please call Rachel at SPA, 904-626-7777. She has all the information on EIB kits, and if you are a builder with most of your parts, she will be able to set you up with what it takes to complete and run your engine at the upcoming Finishing School. With the start of the season, this will likely be our last finishing school before Oshkosh, so if it sounds good, act. Above, Finishing School Results: Jim and Patty Raab with their engine on the run stand. This is now flying on their Zenith 650. in the photo they they are priming the oil system for 15 minutes before the first start. The red drip pans on the heads allow the visual confirmation that oil is reaching every single location in the engine. All Corvairs have hydraulic lifters and high strength head studs, neither of which ever need adjustment during the life span of the motor. 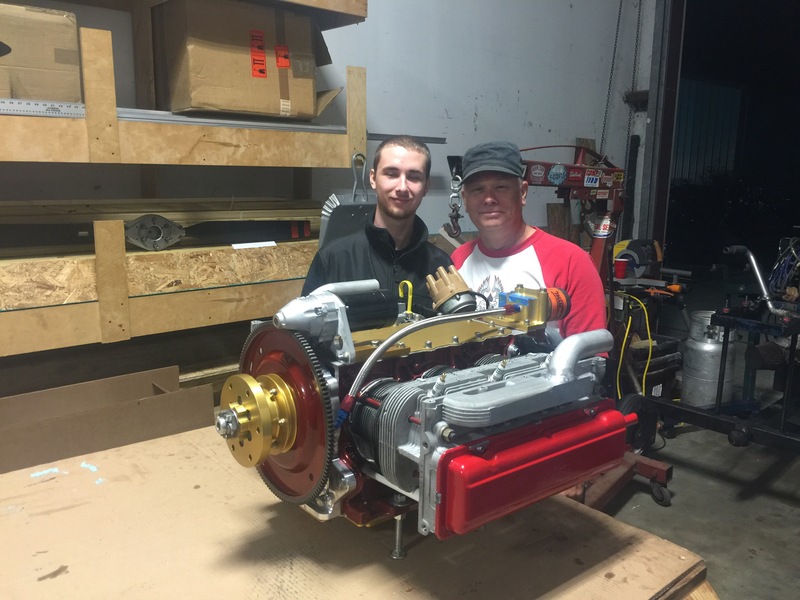 Another Finishing School Photo: David Swan and son, in very proud moment after the run of their 3.0L Corvair, built to power a Bearhawk LSA. David is a good example of committed builder, because he has also spent several days at my hangar learning welding hands on. Any training that improves your skills and makes you a better builder or pilot is money and time well spent. Above, An example of one on one building at my hangar. It’s a fun picture: Mark Borden sets his “Captain Morgan Pose” with his running engine. complete with torque wrench sword and actual product (which neither he nor I drink) but it was all part of a very good time. Captain Morgan probably would find the ‘product placement’ humorous, but I’m guessing that Flight Safety would rather not have their jacket in there. Too bad for them, we were having a day Pappy Boyington would have found fun. Above, Another example of one on one building at my hangar. This is the satisfaction of progress, of having a plan come together. We did this Super Bowl weekend. Later in the year, when the outcome of the Super Bowl has long faded, Justin will take his airplane out to the flight line for its first time. It’s your year, spend it wisely. Its your year, make it count. Corvair Mission 2019, Part #4, Large Colleges. Below is the story of our largest change in operations in 2019. Many people think of large Corvair Colleges as our only interface with builders, ignoring events like airshows, finishing schools, demonstration EIB builds (like CC #44 will be) and one on one training at my hangar, and the newly emerging idea of the 10 person remote build schools. Over the last 20 years, the 43 full Corvair Colleges I have held did gather most of the attention, but we also did a lot of other work. 2018 brought a lot of evaluation, and the honest assessment that while the 14 large flagship Corvair Colleges of Texas and Barnwell were outstanding events, they put a very heavy annual burden on two small groups of highly motivated volunteers. While the hundreds of builders they hosted were deeply appreciative and expressed this, in our larger community of builders if kind of became taken for granted that there would always be a Texas or Barnwell College to attend when ever people got around to it. Nothing wrong with someone saying “I’m going to attend Barnwell someday” but the intention was not to conscript these friends into lifetime service, they were stepping up years ago, to fill a need and motivate others. Above, P.F. Beck in the black shirt and part of his loyal crew at Barnwell. I shot this the last hour of Corvair College #43 last november. These people brought you Nine Corvair Colleges. – think about that; not just 20% of the Colleges held, but because of their size, 35% of the people who attended a College did so at Barnwell. There were very detailed events, and the typical budget was over $7,000, but not a dime went to these people, they did it all as a show of South Carolina hospitality, their belief in the Corvair as an excellent way of getting more active builders in experimental aviation, and a particularly strong pride in their home airport, a facility they devoted a large part of their lives to. Above Kevin Purtee and Shelley Tumino, between Earl Brown and Katrina. I took this picture at Brodhead 2018. These friends, along with ‘Super Dave’ Hoehn of AZ, were the core people of bringing five major Corvair Colleges to Texas. Again. this was a titanic first class effort, done completely as volunteers. They hosted more than 10% of the Colleges, and more than 20% of the builders. They hosted a College every year Kevin wasn’t deployed. Additionally, Shelley did all on-line registration for all the Colleges for many years. People like this do not grow on trees, and you can justifiably feel blessed to have a handful of them in your life. After speaking with P.F. , Kevin and Shelley, I have come to the decision that we are going to suspend large colleges in Texas and SC for 2019, replacing them with the smaller training colleges I was speaking of in part 2 of this series. While I am already nostalgic about good times we have all had, this isn’t a tough choice, because while neither group ever complained a bit, it was very obvious to me and many other people, that a handful of Volunteers were doing a tremendous amount of work, and it was long past when would should have others shoulder some of the work. The of the good things about the 10-12 builder new format is how it allows a host to come forward, without them committing to the giant workload of a College the size of one in Texas or Barnwell. In NC, we have already had Dan and Tracy Sheradin offer to host one in the fall to take up part of the gap which will be left by Barnwell. If you are one of the many who benefited from the generosity of these hosts, please use the comments section to share a note of gratitude for their efforts and what you received from them. I will get to Corvair Colleges next, but here we will cover ‘Events’ which are public airshows and other general aviation events where I am going to be meeting builders. Below is a list of events I will be attending. I may add something later, but you can count on these. Above, is picture I took the night before Oshkosh 2018 started. It is Paul Salter’s Panther parked in my booth at sunset, 12 hours before the start. The image captures the moment, months of prep work with friends, and the last quiet hours before the start of the worlds largest airshow. I attended Sun n Fun every single year, 1989-2015, usually staying for the whole week. After missing 2016 because I was on the western tour, I have had a limited presence, but I will be back for much of this years event. SPA, always has a full week presence, showing the Panther aircraft and Corvair parts. SPA holds their sign up BBQ every year on Friday in the campground, a great social occasion. This year I am also 1/4 sponsor of a cookout for Zenith builders. It will be held on Thursday evening. If you are heading to Sun n Fun, there will plenty of good things to see and opportunities to meet other Corvair builders. Brodhead Pietenpol Gathering, Brodhead WI, July 19-20th. I have missed Brodhead only 3 times in the last 25 years, but I will be there in 2019. It is one of Americas great small airports. It is about 90 miles south west of Oshkosh. It is informal, and if you are a Pietenpol builder, it is a must do event. I’m usually the last speaker on Saturday. Oshkosh / AirVenture July 22-28. I always have a booth at Oshkosh, it is always in the North Aircraft Display area. This year, they have entirely re-arranged the area, but know that my booth is just 75 yards from where it has always been. The entire area traditional reserved for experimental companies, has now been turned into aircraft parking, and the companies have all been moved closer to the forums and workshops. This will be a very good year for Corvair powered planes at Oshkosh, if you were thinking of going some day, this would be the year to do it. Zenith Aircraft Open House, Mexico MO. / Corvair College #44, September 20-21. I attend this event every year. If you are a Zenith builder, it is not to be missed. We have held many traditional, large Corvair Colleges at Zenith just before the open house. In recent years, we have switched to having an EIB Corvair engine build up and test run, in addition to limited work on several other builders engines, selected for their educational potential for people watching. This event will be called Corvair College #44, but it is open to anyone present wishing to observe, unlike traditional colleges which require registration. You don’t need to be a Zenith builder to attend. Deland Sport Aviation Showcase, Deland FL, November 14-16. I have attended this the last few years, and it is unique among general aviation events that it is centered on homebuilding. There is no “Airshow” this is about participating, not being a spectator. Im considering doing an engine assembly and/or bringing my Wagabond down for demo flights. This event is very inexpensive, and low hassle. in USMC parlarance, it has an excellent “Tooth to tail ratio” . I’m open to other ideas, please use the comments section if you have an event you think Corvair builders should get together at. One problem for us to directly serve west coast builders with in person training is the fact my current test stand must be driven to the event in a truck or trailer. In 2016, I did this lap around America: Back in Florida after 7,380 miles on tour., , but it isn’t the kind of tour you can run every year on a budget provided by the overhead from a low cost engine program. Before this, we had used Pat Panzera’s test stand at College #5, #13 and #18. (all in CA) In 2009 in Washington I used a Zenith 750 airframe for demo runs. These were stop gap solutions, and this year we have an effective solution: The Mobile Test Stand. Above, My test stand, which has run nearly 500 Corvair engines in the last 20 years. It has been through a number of changes, mostly to shrink it in size so it can fit into my enclosed trailer. (The tongue folds and the fuel tank pivots down) with an engine on it, it clears the trailer door by 5/8″. It works great, but we needed a ‘clean sheet’ design to make it mobile. OK, here is the new idea: Dan Weseman and I have gone over a mobile test stand design which can be unbolted into parts in 20 minutes, and strapped down to a pallet for truck shipping. We already have enough parts to set it up, we need only fine tune the design and build it. Le’ts say we want to have a training event in Salt Lake City; All we need is a local builder with a hangar, and we would truck ship the Mobile stand out a week in advance, and fly out commercial. On Sunday afternoon, break it down, put it on the pallet, and head home. We could be back in Florida working on Monday. This concept will make holding many events possible west of the Mississippi. If we hold a session in Yuma AZ, and one later in Norther CA, the pallet could be driven in a pickup there or sent on a commercial truck. It need not always return direct to Florida. It is easier than anyone on the west coast building a stand, because that can’t easily move interstate nor make one way trips. When we have big colleges like Barnwell, we can use it to run more engines side by side with out regular stand. Now, time to speak about costs: Building this new stand isn’t a big deal, it might cost $1,000 if we go fancy on it, take a weekend, tops. But let’s start thinking of trips: How about another event in Portland OR? The Mobile Stand will likely cost $400 to move each way. If just me gets on a plane, call the travel expenses $600. Double that if Dan comes also. Maybe $300 more if we need a motel or a rental car. So a basic trip like this is $1,500 -$2,500, and that is with us volunteering our time. I’m picturing doing as many as four or five of these a year. I’m thinking small group events with 10-12 builders. This allows us to do it without the logistics of large colleges like the ones Kevin and Shelley hosted in Texas or the nine done by PF Beck and crew in Barnwell SC. Other than Steve Glover in Chino CA, we don’t have a proven big venue that will draw 50-60 builders in the west for a full scale college, and if you go back and read part #1 of this series, I’m looking for ways to get much more effective training, and I think we are going to do it in smaller groups rather than more larger Colleges. Dan, Rachel and I have seen this work with events like this: Corvair Finishing School #1, Video report.. I still like regular Colleges, but I’m looking at how to deploy our finite resources, particularly time, to get the maximum amount of real information transfer to builders. Is this a valuable idea to builders? Having a Mobile Test Stand solves the issue of taking weeks out of the shop and driving around the country, but it isn’t addressing the cost. Five events at a $2K average is a chunk of money, and I will assure anyone my mark up on parts has a hard time covering that, the $4K of going to Oshkosh and a few free Colleges. So the core issue here is the simple question: Would you as a builder pay $250 to get into a 10 person training event in your home state? Would you be willing to do this even if your engine wasn’t ready to run? These are questions I would like to hear the answers to and perspectives from builders in the comments section. I have held 43 free Corvair Colleges, and there will be more, but to intensify the training in 2019, I’m looking at asking builders if they would be willing to cover the direct costs of smaller training events closer to where they live. I’m also listening for builders (specifically people who have attended at least one College before) who might host these gatherings. Please share your thoughts and possible locations. I typically put out an ‘Outlook’ statement in January each year, outlining the game plan for who I will work with builder during the upcoming year, what we will focus on, events in the works. This year is a but different, as it is my 30th year in the business, and I spent the last 4 months of 2018 speaking with many friends, in a rigorous evaluation of what the strengths of the Corvair movement are, what builders need, and how best to serve them. The Golden Rule: ” In a demanding environment, the most reliable machine will be the simplest one, at the hands of the best trained operator.” – ww. It has been my long held conviction that our motor and the process building them are very well developed, but way too many builders, including many who have attended colleges, are getting just a fraction of what we are offering in education and experience. The centerpiece of my work in 2019 will be increasing the understanding of each individual builder. This year is my 30th year of working with Corvair flight engines. The goal has always been to learn build and fly. The internet made the distribution of that information much easier, but it also brought incredible distractions, opinions from countless people without relevant experience, and it radically accelerated peoples consumerism, all of which distracted from or directly attacked the transmission of the experience and understanding I am working to share. This is pervasive, as some people attending Corvair Colleges miss basic information, simply because they got distracted by other things when the mission at hand was learning. In 2019, I am going to directly and plainly address the “Learning Gap,” in everything I do, this will be priority #1. If you got into homebuilding to see how much you could learn, understand, build and operate, this should be a very welcome declaration. A) They are not flying the correct carb set up correctly for their plane. When correct, carbs are stupid simple and very reliable, and I will put their operational record against that of EFI any day of the year. But we have people who don’t use the right carb, or ever verify its operation. Addressing this is the motivation behind the testing in these stories: Shootout at the Stromberg corral , .Stromberg Shootout, Pt #2,.and. MA3-SPA Test Runs.. . This information will be part of an ongoing push to get builders to use the right carb, set up correctly. B) For 10 years I have told builders to not use the nose bowl inlets as they come out of the mold, but they must take 30 minutes when mounting the cowl to open the inlets and install inlet rings. Perhaps only 30% of builders did this. The other 70% of people includes people who were out on the internet complaining their plane ran hot. It includes people who flew to airshows and Colleges. This is the equivalent of buying a new radiator for your car, but only filling it half way and leaving the cap off. After a decade, The solution is to offer a new cowl, which has these things already done, so people who can’t be bothered will have it done for them. This cost a lot of time and effort to have new molds made, but in the end I said every thing I could about this and only got 30% compliance. The New cowl is better, but it’s primary goal was to address the 70% who would not follow the directions. .‘STOL Bowl’ availability starts tomorrow.. is a story about this cowl as a solution to getting people to use the cooling potential of the engine. C) I must have written 100 stories about how critical it is to set the timing on ANY flight engine. Just like this: YOU MUST SET THE TIMING ON YOUR ENGINE. Could not be more plain. I have showed 100’s of builders how to do this for free at 43 colleges, yet, we still have people who will not do this. Something which has emerged is builders who don’t do it because the don’t want to stand behind a running engine with a timing light. This is odd, because many of the same people stood right behind their engine when it ran at a College. Yet, when they are home, they may set the timing at idle, but will not run it up as required. This leads to this development: .Dual 50K volt test ignition. This specific system has no points and no advance. The timing on it can be set at idle…….Is it better than the E/P and E/P-X systems that I have been making for 14 years? The answer is Yes, if the builder is not doing to set the timing at full static RPM. This test:.“Corvair Fast Burn” Ignition timing settings , is an evaluation of fixed timing settings, and to further demonstrate that the timing must be set on ANY engine. LOOKING AHEAD: I will shortly put out notes on Colleges, Finishing Schools , airshows and and other learning and training opportunities. Builders will shortly see how the format of Colleges will be redone this year. If you wonder why, come back and read this, and understand that my primary focus of sharing my experience has never changes, but I am in the process of adjusting it to have a better success rate with all builders. The sun is just setting here, but 15 minutes ago we had pretty close to standard atmospheric conditions here, and it was an excellent time for an important test I wanted done with a minimal correction factor. I was testing “Corvair Fast Burn” ignition timing settings. OK, here is the concept: If you……. The engine can be set to make 98% of it’s potential power output, with greatly reduced ignition advance, giving it a very, very wide margin of safety against detonation. Even with reduced octane fuels. NOTE, this isn’t the air fuel ratio we use. This is just the one captured in the picture. The actual ratio is 12;1 to 12.5:1 . -thanks, ww. Above, the digital Air-Fuel meter from this story:Shootout at the Stromberg corral in action. When I say the carb must be spot on for the setting to work, It means you have to have the correct model carb, jetting as we recommend, not something that kind of looks like it. If you have a carb running lean, it will be very prone to detonation, no matter what other factors are at play. When you read that 115/145 octane fuel was used on the last of the piston powered airliners and bombers, the dual rating of the fuel is its comparative Octane rating for running lean (the first number) and rich (the second number) The Octane of the fuel you are using means nothing if it is running lean. OK, the results. I use the panel of the run stand as a note pad, because it is easier than writing on a clip board in a 125mph wind. The first number is the total timing advance, the second number is the full static rpm of my test prop. 35 degrees (never use this) is 3360 rpm. This worked because it was a cool day, and I have everything set perfectly, on a hot day, sustained power at this setting would be on the ragged limit of detonation. Now look at 26 Degrees: It turned 3340 rpm. That is 98% of the power output, but with 9 less degrees of ignition advance. Note this set of tests was conducted with 90 octane gas. I will very shortly have a more formal recommendation to setting the timing on 3.0 and 3.3 Corvairs, but as a starting point, there is no need to use more than 26 degrees. The power output difference is hardly measurable, but the detonation resistance is radically increased. Thought for the Day: What Girl Scout Cookies can teach you about Homebuilding. It’s that season again, when little green and brown clad urchins barricade supermarket exits and demand $4 and your will power before they let you pass. I’m against negotiating with terrorists, but I do have a particular problem with Thin Mints and Tag-alongs that makes me a poor negotiator on this subject. Wouldn’t it be great if Girl Scout Cookies were good for you? What if they had no calories, were completely balanced nutrition, and you dentist said things like “Your teeth are so white, I see you have been keeping up on your Thin Mints”. A pleasant fantasy, but everyone understands it isn’t vaguely associated with reality. Above; My 1939 copy of “Your Wings” by Assen Jordanoff, and proof I have no will power around Girl Scout Cookies. The book is a classic from an era where knowing your stuff was central to being an aviator. It still is, but most people would rather be wowed by interiors, glass cockpits and paint jobs. They pay little attention to the fundamentals of flying. This $20 used book has more human reward and satisfaction in it than any $2,000 interior ever will. OK, so everyone understands how idiotic it would be if I tried to tell people a diet made of 100% cookies was good for you, why don’t the equivalent fantasies in aviation bring the same condemnation? If you catch anyone in homebuilding saying any part of the above statement, or any variation on it, please treat them as if they are telling you Girl Scout Cookies are pure nutrition. Well built planes are made of reading, learning, understanding and craftsmanship. Their successful operation is made of training, understanding and good judgment. There are no short cuts to this, there is no magic. There is a certain kind of person who doesnt like hearing what I just said. They like thinking they can game the system, or in modern parlance, “hack” it to allow them some personal short cut. They think paying your dues, learning and real training is for average people who can’t figure out the angles. After 30 years in homebuilding, I can tell you these are the first people to quit…if they are lucky. In the rare chance they finish, sooner or later, reality and physics show up with a bill that can’t be paid.